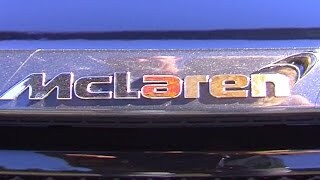 With the McLaren 650S Le Mans 2015 limited edition version, McLaren clearly portrayed its intention to create new benchmarks in the sports car segment. The 650S Le Mans 2015 launched at 2014 Geneva Motor Show is impeccably a pure signature of designing and power compiled together. We are sure that after reading this review you’ll dream to have this model. Let us check its specifications and get to know the interior, exterior and performance a little better. The interior of McLaren 650S Le Mans 2015 is gorgeously sportive. Wrapped all in the carbon-fiber, leather and Alcantara the interior is simply beyond the gleams of a dream sports car. The Alcantara wrapped steering wheel gives you perfect grip on it and simultaneously better command on track with mounted controls. The soft black floor mats made from leather and Alcantara add to the impeccable status symbol offered. The Center stack and door panels gets adored with the carbon fiber inserts while the Alcantara orange surfaced seats provide comfort with branding assigned over headrests. The entire well designed and smooth interior with its black texture very well highlights the orange Alcantara on seats. Exterior of McLaren 650S Le Mans 2015 holds the symbolic work paying tribute to the 1995 victory gainer McLaren F1 GTR. Despite not much of changes the model stands ahead of other 650S models with its all new carbon-fiber splitter and the MSO-built front fenders. Just like the carbon-fiber molded front fender the rear gets a spoiler and diffuser made from same material. The side profile of McLaren 650S Le Mans 2015 showcases the orange brake calipers fitted on five spoke alloy wheels, again bringing remembrances from the historical McLaren F1 GTR. Painted in dark gray hue, almost identical to the winner from past, McLaren has very well paid tribute to the only Le Mans winner till date from the house of McLaren. Last but not the least for this lightweight model, are the 19” front and 20” rear wheels. 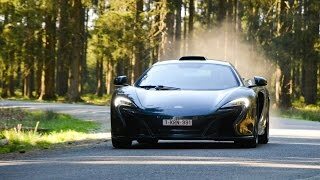 The McLaren 650S Le Mans 2015 gets its enthralling power through a 3.8 liter V8 Turbo engine distributing magnificent 641 hp power and 678 nm torque mated to seven-speed dual clutch transmission. The lightweight of 650S Le Mans 2015 combined with the magnificent power producing engine take the driver to a top speed of 207 mph while the 0-62 mph (0-100 km h) sprint gets crossed in just 3.0 seconds. 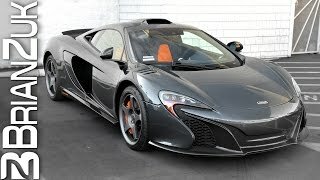 Talking about the price of McLaren 650S Le Mans 2015 it takes the price meter to a whooping $371,000.